I remember an old Girl Scout song we used to sing around the campfire. It went, "Make new friends but keep the old, one is silver and the others gold." Sure, it's easy to make friends when you're young, but it becomes a lot more challenging as you get older. If you're not naturally friendly, it may be difficult to start a conversation with a potential friend without feeling weird. If a female friend is specifically what you're after, where do you go to find these potential BFFs? You could take a class, join a book club, or join an amateur theatrical group, but they can take time away that you could be spending with your friend. You might have a mutual friend set you up or just poach someone's else's friend, but either of those scenarios can get messy and can lead to jealousy and hurt feelings. It's so much easier to find sexual and romantic relationships with apps like Tinder and OkCupid, but what can you do to find women you completely click with in a friendship way? Say hello to the new app Hey! 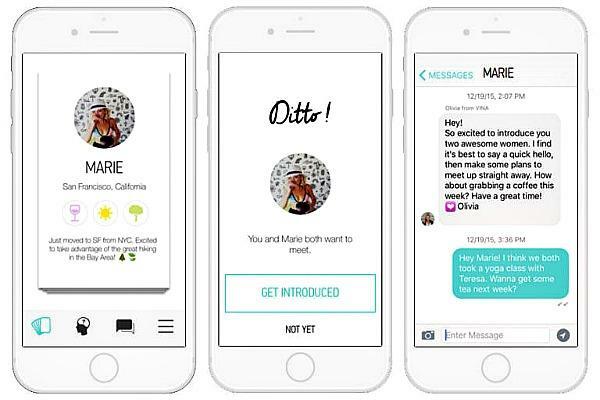 VINA, which hopes to solve the challenges of making new friends as adult women with a Tinder-style user experience and a proprietary matching algorithm to suggest potential new friends based on mutual friends, proximity, and quiz data. Hey! VINA says on their website, "The people we meet change our lives. Whether they help you find your next job, the love of your life, or a place to live, we all get by with a little help from our friends. Hey! VINA empowers women to tap into the power of their extended network to make new connections in the real world." With the Hey! VINA app you can find activity partners: women who also enjoy going wine-tasting, bike-riding, museum-going and flash mobs — anything that you like to do, you can probably find someone else who likes it, too. You can also find a learning partner since it's always more fun to learn something with a buddy. Plus, Hey! VINA can give you a new perspective by using it when you travel and meeting new friends in foreign lands. Hey! VINA makes introductions based on your existing network and you're matched based on your favorite activities and life stage. If you're a new mom, you'll be matched with other new moms, and so on. Swipe through suggested "vinas" until you find a likely candidate for friendship. You don't even have to worry about being the first person to make a move — Hey! VINA will send both of you an introduction message when you get a match. When you do get a match, Hey! VINA suggests you try to meet in real time right away because the whole point is to be friends IRL. Hey! VINA creators Olivia June Poole and Jen Aprahamian told The Huffington Post, "Female friendships are absolutely essential. We hope women find their new best friends, traveling partners, brunch dates, wing girls, mommy friends, workout partners, etc. on the platform." The benefits of friendship, whether it's old or new, are many. And there's something about a new friendship that adds a little extra happiness and excitement to your life.